This document is out-of-date and was never authoritative. This is not an official source for RISC-V information. It is here only historical purposes. Please consult riscv.org for the most up-to-date information. The purpose of this page is to document the assumptions made during the development of the RISC-V port of the Linux kernel. A project with a duration such as this requires adequate documentation to support future development and maintenance. This document is created with the hope of being useful; however, its accuracy is not guaranteed. This document is currently under development. This document is copyrighted by Quan Nguyen, © 2013. All rights reserved. I do intend, however, to release this document to the public freely upon its satisfactory completion. 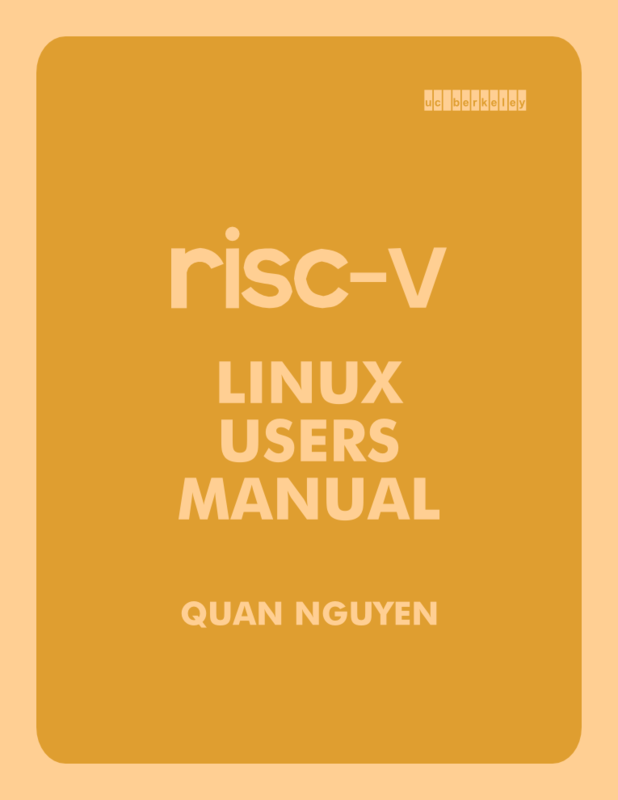 A full description of the history can be found in Volume I of the RISC-V Instruction Set Manual. While the architecture intends to be a clean break, its implementation contains many remnants of predecessor architectures. In particular, the port of gcc and glibc derive from MIPS; as a result, architectural decisions that were not explicitly made by the RISC-V ISA have been inherited from MIPS. The RISC-V port of Linux itself is also inspired by parts of the Linux-MIPS codebase; however, careful considerations were made to rely as little on MIPS conventions as possible. Therefore, when this document is unclear, referring to the MIPS specification for the corresponding topic may yield insight. For 64-bit versions of RISC-V, the XPRs are 64-bits wide, and for 32-bit versions of RISC-V, the XPRs are 32-bits wide. The privileged control registers may have different widths, depending on the nature of the register. The RISC-V port of the Linux kernel uses the following conventions for its registers. MIPS convention note: The pipe2 system call is specially handled by MIPS implementations, but the RISC-V port of glibc has been patched to remove this behavior. The RISC-V port of the Linux kernel does not use any floating-point hardware. There are no assumptions made about the values of the floating-point registers, or the status register fsr. The privileged control registers (PCRs) are used by the processor in Supervisor mode to complete tasks such as memory management and exception handling. These are not accessible from userspace. Simulator implementation note: The tosim and fromsim registers are magical PCRs that do special commands based on the packet whose physical address is written to these registers. Shown are the values that are known at processor startup. Other than the obvious 0 and 1, a ? is undefined and X as "don't care." Simulator implementation note: The simulator sets the the interrupt mask (IM) to all 1, previous-supervisor (PS) to 0, and all EC/EV/EF to 0. All interrupts (and exceptions) enter through one exception handler, the address of which is located in the evec PCR. Interrupt priority decreases as the interrupt number increases; in this case, the timer interrupt is always taken last. Each interrupt is associated with an exception number, to be placed in the cause PCR. Simulator implementation note: The ISA functional simulator differs from this behavior by setting the topmost bit of the cause register if it is an interrupt. Exceptions are taken as the faulting instruction is executed. The behavior of each exception is different, particularly in the semantics of how error values are saved. The list is not comprehensive, but covers the most useful registers. If an exception is not handled by Linux, the kernel will panic. ISA oddity note: Most exceptions that can be handled by Linux return to exactly epc to repeat the instruction. However, this behavior is not desirable for system calls or breakpoints. The functional simulator does not distinguish system calls or breakpoints from other exceptions, and any use of the eret instruction will repeatedly jump on the syscall or break instructions. Therefore, for these two exceptions, the Linux exception handler will manually increment epc by one instruction forward (epc <- epc + 0x4) before returning to the program that triggered the exception. MIPS convention note: The RISC-V ABI, in both its forms, RV32 and RV64, share many commonalites with their respective MIPS counterparts; MIPS O32 and MIPS64. Yunsup notes that RISC-V also takes cues from the MIPS Embedded ABI (EABI). However, it is the conclusion of the author that some ABI decisions made by MIPS developers were brain-damaged unsuitable for RISC-V to make a "clean break" from previous architectures. The number of the syscall can be found in arch/riscv/asm/include/unistd.h, but it includes the file include/linux/asm-generic/unistd.h, so users may refer to that instead. Load the syscall number into v0. Syscalls currently may have up to six arguments to be used. RISC-V provides eight argument registers, so all arguments may be passed via registers a0 through a7. Load the syscall arguments into a0 through a7. This invokes the kernel handler for syscalls. Linux returns the result of the syscall in register v0. Again, this stipulates that a3 is clobbered. The author presumes that twiddling with sp or tp will be very bad ideas. Various things provide error codes for failed system calls or kernel functions. The field below provides a lookup table for the error values for the RISC-V port of Linux. The file can also be found at include/asm-generic/errno-base.h and include/asm-generic/errno.h. The registers are saved into the kernel-mode stack for the process, located at current->stack, where current also refers to the k0 PCR.